It’s been a long week/month/year. Have some cheesecake. Good things happen when L.A. chefs take creative license with this creamy classic dessert. Here are four of the best cheesecakes in L.A. right now. 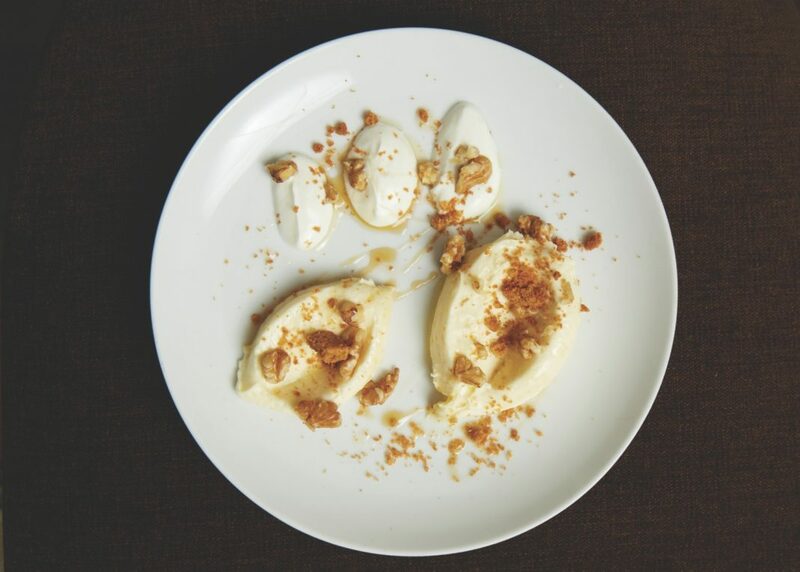 Miles Thompson’s deconstructionist take involves dollops of airy sour cream curd, crushed walnuts, and sweet graham cracker crumbs. The avant-garde plating might not resemble anything classic, but the dish hits the right nostalgic notes. 1147 3rd St., Santa Monica. The lush cream cheese filling and supple crust make it tempting enough to begin with, but spread with a thin layer of guava jelly, a pink-tinted slice at this reimagined Jewish deli has enough tangy pop to keep drawing you back for another bite. 2619 W. Sunset Blvd., Echo Park. At her new-wave Spanish spot in Highland Park, Teresa Montaño swaps in tart goat cheese for the usual Philadelphia fluff and crumbled sourdough toast for graham crackers. Paired with fruit and honey, it’s a cheese plate in cake form. 5715 N. Figueroa St., Highland Park. Ube Cheesecake from Creme Caramel L.A.
Kristine de la Cruz uses ube, a sweet yam from the Philippines, to lend a shock of purple to her sweet creations: ube upside-down pie, ube scones, even ube horchata. The crowd favorite? Ambrosial ube cheesecake swirled with color. 14849 Burbank Blvd., Sherman Oaks.